Dante Gabriel Rossetti was the main intellectual force behind the Pre-Raphaelite Brotherhood (PRB), formed in 1848, which during its brief existence affected a revolution in British painting. The important members were Rossetti, William Holman Hunt, and John Everett Millais. Ford Madox Brown never became a member of the PRB, but acted as mentor and supporter. The true Pre-Raphaelite period was brief, lasting from the formation of the brotherhood in 1848 until its effective disbanding in c.1852. The movement retained a certain consistency until c.1865, but after this its importance was mainly through its influence on a new generation of painters. Rossetti exhibited only two oil paintings during the PRB period. Discouraged by adverse criticism he turned almost exclusively to painting in watercolours. It was in this medium that he produced a series of highly imaginative works based on literary and historical subjects, most commonly set in the middle ages. Rossetti was a highly literary man who read deeply in Shakespeare, Keats, Browning and above all Dante. In 1848 he completed his translation of Dante's 'Vita Nuova', and intended to complete 13 watercolours illustrating episodes from the poet's life. In fact he seems only to have finished a very small portion of them. Today only four are recorded, including the present work. The picture shows Dante dressed in a full-length red tunic and leaning on a wall frescoed with light blue angels. A small girl wearing a gold coloured dress offers him flowers. Directly behind her is the figure of Beatrice flanked by two dark-haired bridesmaids. Beatrice is walking in a bridesmaid's procession towards the wedding feast. Dante gazes at his beloved as she passes but she looks haughtily at him. When the present watercolour was first exhibited in 1852, the catalogue carried an abbreviated passage from the 'Vita Nuova', describing the subject of the work. Rossetti's father was a scholar of Dante. The artist often identified himself with the poet whose name he shared. And Beatrice became for him the poetic counterpart of his lover Elizabeth Siddall who by this date was living with him. She was the model for the figure of Beatrice in this watercolour. Later she was immortalised in Rossetti's famous 'Beata Beatrix' which commemorates her tragic and self-inflicted death in 1862 from an overdose of laudanum. When it was exhibited in 1852 the present watercolour attracted the admiration of the great critic, John Ruskin: "I am very much delighted with a sketch of Rossetti's in the Winter Exhibition Beatrice and Dante - a most glorious piece of colour. The breadth of the blue-green - and fragmentary gold is a perfect feast" (Ruskin to Holman Hunt, 9 January 1853). Such was his admiration that he shortly afterwards acquired a second version of this watercolour painted in 1855 which is now in the Ashmolean Museum, Oxford. H C Marillier, The Art Journal , 'The Salutations of Beatrice', London, Dec 1899, pp 353–57: p 356. Peter Raissis, Look , 'Enter Dante Gabriel Rossetti', Sydney, Apr 2004, pp 9–12: pp 9, 11, col illus 10–11. Victorian watercolours from the Art Gallery of New South Wales , Sydney, 2017, pp 18, 168, 170, col illus pp 8 (detail), 170. William Michael Rossetti, The Art Journal , 'Notes on Rossetti and his works', London, 1884, pp 148–52: p 151. A.I. Grieve, The art of Dante Gabriel Rossetti: watercolours and drawings of 1850-1855 , 1978, vol 3, pp 17–18, no 14, illus p 17. Royal Academy of Arts, Dante Gabriel Rossetti: painter and poet , 1973, p 33, no 87, illus plate VIIIa. Virginia Surtees, The paintings and drawings of Dante Gabriel Rossetti, 1828-1882: a catalogue raisonné , Oxford, 1971, vol 1, p 17, no 50, illus vol 2, pl 33. Oswald Dougherty and John Robert Wahl (Editors), Letters of Dante Gabriel Rossetti , Oxford, 1965-1967, vol 1 (1835-1860), p 122. Tate Britain, Loan exhibition of paintings and drawings of the 1860 period , 1923, no 1. City of Bradford Art Gallery, Catalogue of the works of art in the Cartwright Memorial Hall , 1904, p 13, no 92. Præraphaelite diaries and letters , London, 1900, p 306. H.C. Marillier, Dante Gabriel Rossetti: an illustrated memorial of his art and life , London, 1899, p 150, no 30, illus p 150. New Gallery, Exhibition of pictures ancient and modern by artists of the British and Continental Schools: including a special selection from the works of Dante Gabriel Rossetti: The New Gallery, Regent Street, 1897-8 , London, 1897, p 18, no 54. W M Rossetti, Dante Gabriel Rossetti: his family letters, with a memoir, 2 vols , London, 1895, vol 1, pp 173, 179. Crayon , New York, 23 May 1855. H Virtue Tebbs, Pictures, drawings, designs and studies by the late Dante Gabriel Rossetti , London, 1883, p 17, no 6. Martina John, Rossettis Dante. Bild-Text--Relationen und Literaturrezeption bei Dante Gabriel Rossetti , Kiel, 2015, pp 175–83, col illus p 394, Abb. 6. 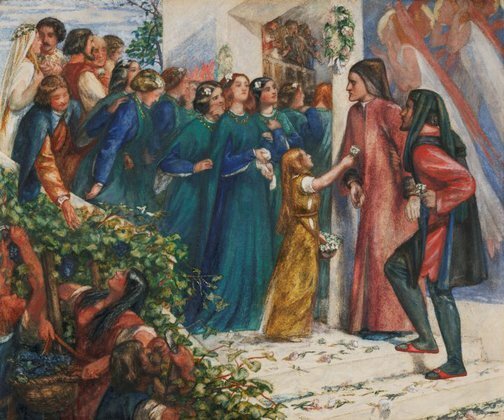 Maris Teresa Benedetti, Dante Gabriel Rossetti , Florence, 1984, pp 172–73, no 29, illus p 172. Tate Britain, The Pre-Raphaelites , 1984, pp 254–55, no 176, illus p 254.